Matt Murdock is blinded by a radioactive substance that falls from an oncoming vehicle while pushing a man to safety from the oncoming truck. While he no longer can see, the radioactive exposure heightens his remaining senses beyond normal human ability and gives him a type of sonar which acts as his vision. Although originally disoriented by these enhanced senses, Murdock is secretly taken under the wing of a sensei, Stick, leader of the ninja clan, The Chaste, who teaches the boy how to control his senses and martial arts. His father, a boxer named Jack Murdock, supports him as he grows up, though Jack is later killed by gangsters after refusing to throw a fight. 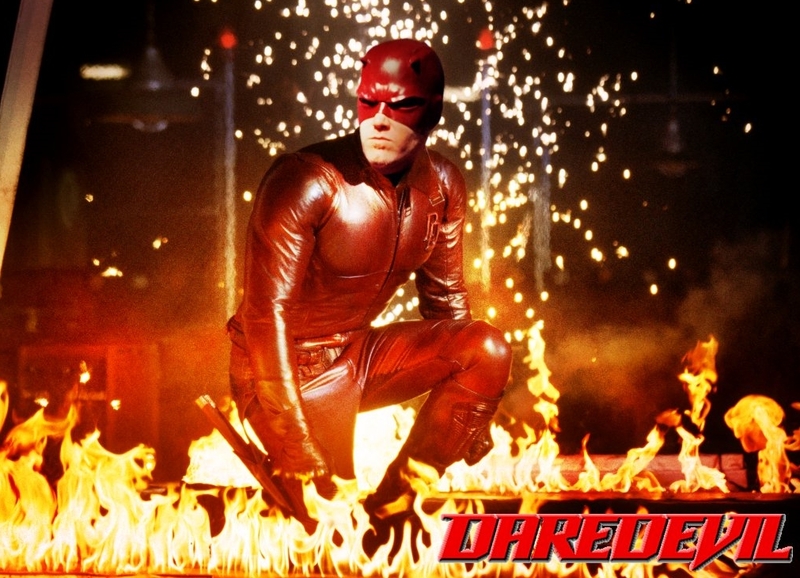 After donning a yellow and dark red costume (later all dark red), Matt seeks out revenge against his father's killers as the superhero Daredevil, fighting against his many enemies, including Bullseye and the Kingpin. He also becomes a lawyer. Daredevil's nickname is "the Man Without Fear"
After a freak accident left him blind, Matt Murdock discovered that although he has lost his sight, his other senses had been raised to super-human levels. After his father is killed by mobsters, Murdock dedicates his life to fighting injustice both inside the courtroom as a lawyer, and outside as the costumed vigilante Daredevil. Ben Affleck as Matt Murdock / Daredevil: An attorney-at-law with a disability who was blinded as a youth in an accident with bio-waste that drastically heightened his remaining senses and gave him a "sonar-sense", which allowed him to perceive his surroundings, and makes a silent promise with his father to "stick up for the long shots". His father is killed not long after and at that moment, he vows to seek justice. At night, he becomes a devil-modeled vigilante who takes justice into his hands. Jennifer Garner as Elektra Natchios: Daughter of billionaire Nikolas Natchios and the love interest of Matt Murdock. At a very young age, she witnessed the murder of her mother, and since then her father has had her become highly trained in martial arts. Colin Farrell as Bullseye: An assassin with perfect accuracy and deep-rooted pride of it who is hired by Kingpin to kill Nikolas and Elektra Natchios, but when Daredevil gets involved and causes him to miss his target, he makes it his own personal vendetta to take Daredevil down. 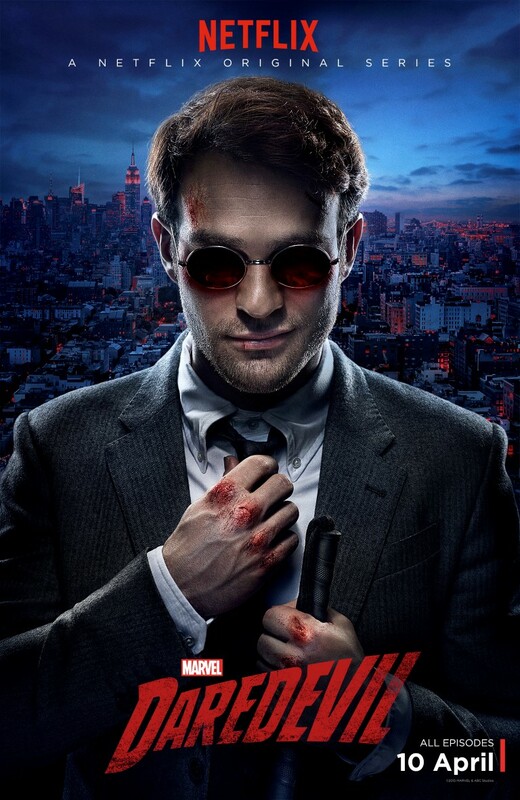 The first season sees lawyer-by-day Matt Murdock use his heightened senses from being blinded as a young boy to fight crime at night on the streets of New York City's Hell’s Kitchen neighborhood as Daredevil. In the second season Murdock crosses paths with Frank Castle / Punisher, a vigilante with far deadlier methods. 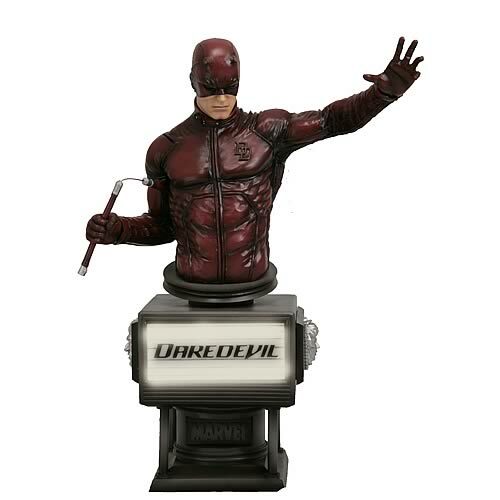 Daredevil Movie Prop Peplicas, Figures, Toys and Collectibles! A Kotobukiya Japanese import, the likeness of actor Ben Affleck is accurately captured in this well-armed, 8" tall fine art bust. The base is a special movie marquee that lights up. 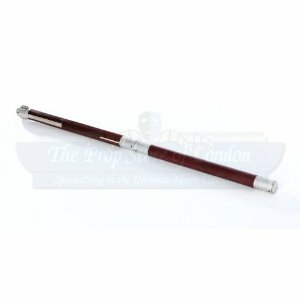 This is an extendable fighting staff used by Daredevil (Ben Affleck) in the 2003 superhero action movie of the same name. This type of weapon can be seen throughout the film as Daredevil fights crime battling Bullseye (Colin Farrell) and The Kingpin (Michael Clarke Duncan.) 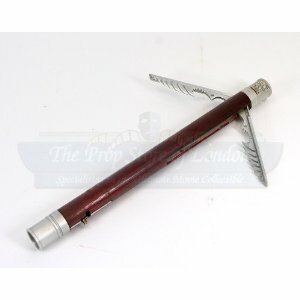 The staff is composed of wood, which has been painted dark red to match the hero's costume, and silver metal and can be pulled open revealing a hidden silver metal rod which extends the piece to a full 47" (119cm!) The top of the staff has small intricate carvings of an angel and a devil making the piece even more unique. This staff measures 25" (64cm) closed, 47" (119cm) open and is in very good condition.